Cook the spaghetti in a big pot of boiling, salted water. While the spaghetti is cooking prepare the sauce. 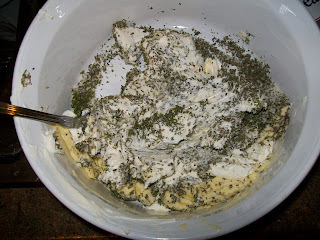 In a big bowl use a fork or a whisk to mash together the margarine, basil, parsley and cream cheese. Mash it until it is smooth and creamy. Add the Parmesan, olive oil, garlic, pepper and salt to taste. I prefer it salty, but others may not. Continue stirring it all up until it is creamy again. Now add the boiling water. Use a glass to dip it out of the boiling spaghetti and put it in a measuring cup, (or just dip with a measuring cup). 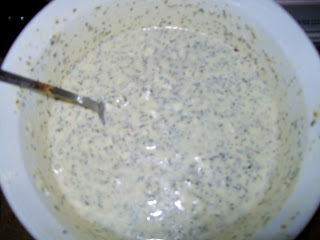 Pour the boiling water in slowly and mix it all up until the sauce is the consistency of thick cream. When the pasta is tender, drain it well, and return it to the pot. Pour the sauce over the cooked spaghetti and toss it all together until it is well mixed. Serve in large bowls with a green salad. Serves 6 or 7. This was sooo good! DH rated it an 8.5 - because he doesn't love pasta like I do. 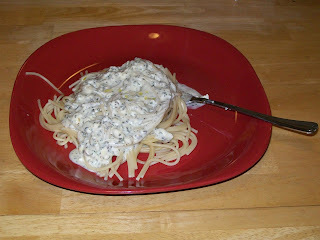 :) I rated it a 9 because it was delish and so easy ! And I bet you have all of those things in your pantry right now! ***Recipe found at The hillbilly housewife ! p.s..: Got any good (Chicken/vegetarian) recipes for me? LMK! Thanks for sharing! That looks so yummy! All I can think about is the calories (or WW POINTS) that would cost me. LOL It looks great tho!